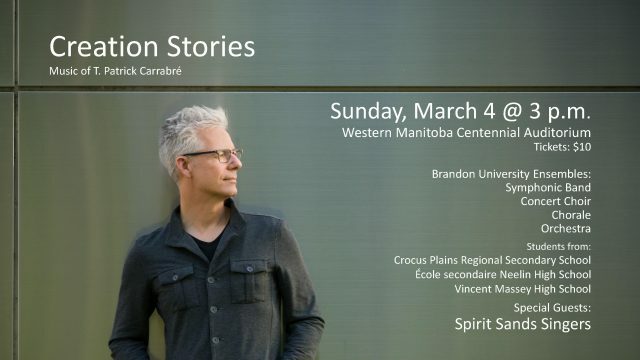 Creation Stories, featuring the music of T. Patrick Carrabré, will take place on Sunday, March 4 at the Western Manitoba Centennial Auditorium. BRANDON – The Brandon University (BU) Orchestra, Concert Choir, Chorale and Symphonic Band will be joined by students from local high schools to perform music by BU Professor T. Patrick Carrabré at a special concert on Sunday, March 4 at the Western Manitoba Centennial Auditorium (WMCA). Honouring Carrabré’s significant contribution to Canadian music, 25 years at Brandon University and his 60th birthday, the program will include a number of works that have never been performed for local audiences. The pow wow group Spirit Sands Singers, led by Michael Esquash Sr., will join the BU Orchestra and choirs in Creation Stories, originally written for the Winnipeg Symphony Orchestra (WSO). Cellist Leanne Zacharias will also take a solo role, in front of the Symphonic Band, in Prairie Sky, a piece the group premiered at the Whistler Music Festival in 2013. “I’m very honoured that my colleagues and our students are coming together to perform some of my bigger pieces,” Carrabré said. The first half of the program will feature the BU Concert Band. The Dragon’s Tail and a revised version of Poseidon’s Trident will be heard alongside Prairie Sky. Poseidon’s Trident was commissioned by the Westman Honour Band, but has since been revised. The second half of the program will be devoted to Creation Stories. Written while Carrabré was composer-in-residence for the WSO, the piece celebrates the diversity of world cultures by including text and music that reflect how many different peoples have “remembered” the creation of the world. While Carrabré wrote most of the music, he also tried to allow for some shared space, with sounds that would otherwise not be possible on the symphonic stage. This meant writing parts that make sense for the orchestra, while leaving space for musicians from oral cultures (not notated) to collaborate in the making of a complete soundscape. The concert will begin at 3 p.m. on Sunday, March 4. Tickets are $10 and are available at the BU School of Music Office or at the WMCA door before the performance.